True Blood’s second season featured several new sets: The FOTS church, Hotel Carmilla, Godric’s Lair, Maryann’s house, the dungeon and my personal favorite the queen’s residence. The creative force behind all these amazing sets is Suzuki Ingerslev, True Blood’s Production Designer. Suzuki previously worked on Six Feet Under, Shark and In Treatment; she received six Primetime Emmy Award nominations and an Art Directors Guild Award nomination for her outstanding work. I was very curious to know more about the True Blood Season 2 sets and Suzuki graciously answered my questions about how she created the sets. In this first article Suzuki tells us about Queen Sophie-Anne’s dayroom. As Production Designer Suzuki and her team have quite a lot of liberty in designing and creating the sets. What can you tell us about the exterior of Queen Sophie-Anne’s residence? Suzuki: “The Queen’s house is an existing location in Malibu, California, and it was definitely one of those locations that you knew was right from the minute you saw it. The pool house has a nostalgic feel to it, while at the same time seems timeless. We really wanted a space that we could turn into a dayroom and still have it feel glamorous and elegant, befitting of a Queen. What we did was create dioramas in each window, so that the dayroom looked like it had views to the ocean. Since vampires could not be out in the day, we figured these dioramas represented everything the Queen missed about not being mortal, such as the sun and sea. It was tricky, we wanted the dioramas to appear somewhat surreal looking so that the audience understood that the Queen had created this dayroom, but on the other hand, we didn’t want the audience to think that we built this set on stage and we put some cheesy backdrops outside the windows. It was funny; the crew arrived at this beautiful location, and was shocked to see that we had covered up all the real views of the ocean, only to have substituted them for our painted dioramas and fake seagulls. Over all I think it worked out well, and the dioramas had an elegant, Natural History museum feel to them, and not a cheap television vibe. Is that a greenhouse in the background next to the house? The interior of the dayroom is simply breathtaking. The amount of details is amazing. The entrance and the room are designed in a nature style that reminds me of Art Deco. Suzuki: “What drew us to this location was exactly what you just mentioned. 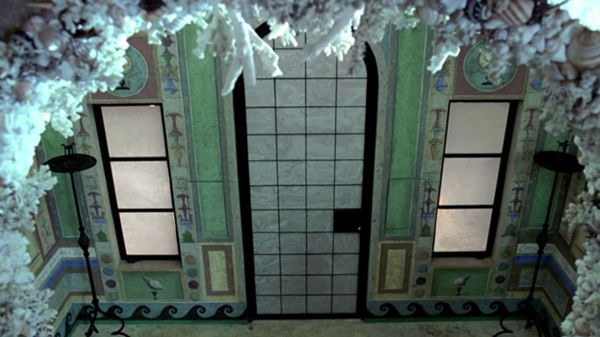 It does have an art deco/ nature feel to it, and the room is definitely one of a kind, with extraordinary detailing. After all the location scouting I have done over the years, in my opinion, nothing even comes close to the amount of detail that went into this pool house. We all just stood there and took the room in the first time we went there, and pictures don’t even begin to do it justice. The Statues, chandeliers, chair rail and ceilings are all made out of a variety of various sizes of seashells and corals. It is astounding, and we could never accomplish this on our budget, and time frame. It is truly breathtaking and exquisite. I just went along with the existing architecture and oceanic feel. We wanted to just embellish on it and not detract from it. The decorations in the entry were hand painted by an artist as per the owner. Apparently, he designed a lot of the pool house himself. The floor is real marble, and since it was already there we had the benefit of shooting it. The owner’s budget is apparently a lot larger than our shows budget [laughs]. How long did it take to complete this set? How many people do you have in your team working on the sets? I noticed the queen’s gold powder box and the 1920’s Vogue that she picks up. Are those authentic props? And how does Suzuki think the Queen decorated the other rooms in her residence? Very cool article! I figured that day room had to be a real location, but I’m still surprised at how much of it was already in place. It’s gorgeous. This is a pool house…what must the main house look like? Everytime I read an article about what goes into producing a show (thanks, Shad for the interview and interesting aricle) I’m amazed by the amount of effort and time involved. This set (location) was the most impressive yet. It was as important (and out-acted ERW) to the scene as the actors. Bill’s swagger wouldn’t have been as much of a knock out without that strut across the pool. And we definitely got that the Queen was a pampered, priviledged vamp because those surroundings were outrageously opulent. Than you Shad for the article. I had wondered about this location. I couldn’t imagine them having the budget to build such a place. It is very beautiful and perfect for the Queen’s dayroom. Like Lis said, I can’t imagine what the main house must look like! The dayroom was simply breathtaking on screen, I cannot imagine what it must be like to see it in person. Great article. Thanks for this, Shad. I don’t always think of the intricacies of set design, construction and dressing when I watch the show week after week. I appreciate learning about what goes into making the finished product that we see on the screen. This was an elegant, glamorous and richly-detailed world that so befitted the Queen of Louisiana. I love art-deco and I could live in the Queen’s Palace! I also assumed, incorrectly, that Suzuki was a man. I wonder how she came by that name? Really?…is that the reason? Or was it a later addition…a knickname? That’s the reason. Her dad liked Japanese culture. Okey dokey. Thanks for the answer. I was thinking she was a motorcycle aficionado. I believe her parents have a great interest in Japanese culture. Shad, what a fabulous article and so beautifully put together. I loved reading about how they made that room look so PERFECT. You did a classy job of presenting the information! They were lucky to find such a fabulous room that so suited TB’s needs. It must have cost a pretty penny for the owner to create! This was a very interesting article. Thank you Shad! I’m glad Suzuki spoke about the dioramas. I was fascinated by them and actually thought to myself…they remind me of the Museum of Natural History ! HEY ! That pool room looks familar to me…. LOL !!! What a great article Shad, so well put together! Thank you for posting it. It really gives the reader and viewer some insight into the process. It sheds alot of light on the prep that goes into what translates to only a few minutes on film…… LOVED THE INTERVIEW !!! Great article Shad! It’s just so….YOU. 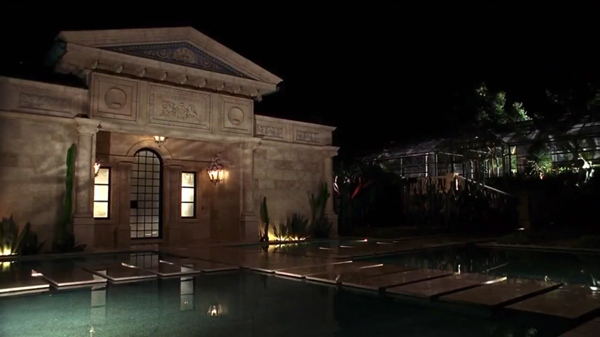 I had wondered if the poolhouse was built by HBO for the show, and now I know. It’s a beautiful place. Shad you know I how love these interviews. I can’t wait for the second installment, seriously I can’t wait. :) Great detail oriented interview. Suzuki’s work is very impressive. Previously I had posted the pool house looked like it was straight out of Architectural Digest and now we know why I would think so. Of course the best feature in the room was Bill Compton. :-) Yes all roads do lead to Bill. I forgot to mention I like the little touches like the powder box and magazine. I think SA would pick a favorite era and follow thru with it in her home. Her personal appearance remains me of Rita Hayworth in the 1940s. Must be the red hair and dress. the powder box was one like my aunt gave to me, except hers was tinier and skinnier. the rest of the description of the house, well, whatever it means, YES, I LOVE IT! my fav part was the outside where you walk across the pool, sort of like a bridge/moat thingy (i ruined that description), but it would have been cool if bill had shoved eric in there. and i was waiting like an aligator. and bill would come in to save him and i would let eric go and swallow bill whole. yep, this put me in a new level of this conversation. Shadaliza thank you for this insightful article on how the beautiful pool room came to be on True Blood. Ms. Ingerslev has a complex job but delivers and amazes us with how she brings True Blood to life through her well thought out set designs. The Queen’s pool room will forever be in my memory as one of the most beautiful rooms to behold and add in Bill Compton and the room just make my romantic imagination go wild. i loved the queen’s palace. art deco is my favorite design period. the design really captred the queen’s mood of girly decadance and frivolity. i love that they didn’t make her home “gothic”. it is amazing to imagine that a real person owns that house. I believe that the painting, chandeliers, and sculpture were all done by Scarlet Abbott, an LA artist and interior designer. Nice Article. I just wanted to point out that the “Artist” that was hired by the owner is an artist named Scarlet Abbott. Her site is scarletabbot.com. She designed the interior of this poolhouse. She ran a crew that did all the surfaces, as well as chandeliers, and furnishings, plus the mirror and floor inlays. She had a separate crew that painted the frescoes. She also spec’ed the furniture. The hand painted walls in the entry are actually a surface that the artist cuts and inlays. each separate color is made from a reinforced plaster like material that is impregnated with natural pigments. They are glued to the wall then sanded lightly and waxed. The pictures do not give it justice. Her talent is amazing and she needs to be recognized for it. The “artist” who put months and months of work into the day house is none other than Scarlett Abbot, an amazing painter and craftswoman from London now living in Los Angeles. She put an unbelievable amount of work into that place! I know first hand how dedicated she is: she decorated our house for my wedding. Just wanted to see her get the credit she so richly deserves! I attended an event in this pool house, and it is a breathtaking work of art. Scarlet Abbott is incredibly talented, and this project is just one of many. 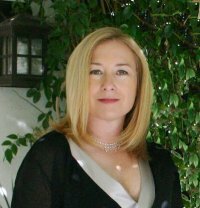 Take a look at her site, http://www.scarletabbott.com/ and prepare to be blown away! The entire home that has this pool room was recently featured I HGTVs Million Dollar Rooms (aired Tuesday 06/19/2012). It’s use on the True Blood show is even mentioned.